This draft class produced a good amount of LB2+-LB3 IDPs. However, the DLs and DBs (safety more specifically) are a different story. As far as true 4-3 DEs go, there aren't a whole lot of good immediate options outside of Chandler Jones and Andre Branch. Shea McClellin and Quintin Coples both have playing time and scheme concerns. Fletcher Cox could make an early and significant impact in Philadelphia and could be useful to fantasy owners in DT-required leagues. Outside of Mark Barron and Harrison Smith, there isn't a whole lot to write home about at the safety position. 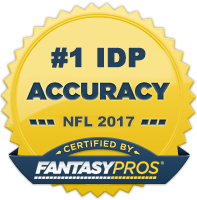 Cornerback production is difficult to project even for the most seasoned IDP writers as their on-the-field skills many times don't translate equally to fantasy success. If I had to make predictions, Dre Kirkpatrick and Stephen Gilmore look to have the best potential for DB3 status this season. With the majority of the IDP value liking falling in the 2-3 rounds of rookie drafts, I'd trade down if I had a late 1st round pick in favor of stockpiling more middle round picks. 1. ILB/OLB Luke Kuechly (CAR) - Kuechly is a pure tackling machine who led the nation in tackles two years running. He's a smart and instinctive player who is equally good against the pass as he is against the run. He will most likely play MLB in Carolina's 4-3 defense and figures to be a three down backer from week 1. He projects as a solid LB2+ this season and should be the #1 rookie IDP taken off the board in drafts this season. 2. RDE/ROLB Chandler Jones (NE) - Bill Belicheck and company drafted Jones with the hopes that he could immediately step into the "Elephant" role previously held by very productive fantasy players like Willie McGinest and Andre Carter. So far this season, Jones has, by all accounts, been phenomenal. I have a feeling that Jones will continue to climb up my rankings during the preseason (possibly into the top 25-30) and could wind up being the most valuable rookie IDP this season. 3. WLB Lavonte David (TB) - Tampa Bay has already slotted in David as the starter on the weak side of the defense. He's rangy and should be an above average subpackage player. He's the clear cut #2 rookie LB behind Kuechly and should see a ton of tackle opportunity in his rookie season. If he can learn how to get off blocks more effectively and perhaps add a few pounds to his frame during the off-season, he could easily develop into one of this year's top rookie IDPs. 4. SS Mark Barron (TB) - Barron isn't on the same level as an Eric Berry when he came out back in 2010, but he was clearly the best safety in this year's shallow draft class. He will be the every down starter from day 1 in Tampa Bay and should see decent tackle opportunity behind a relatively inexperienced set of young linebackers. The Bucs will likely bring him up to help in run support quite a bit early translating to good tackle production. Expect solid DB2-DB2+ numbers out of this youngster. 5. MLB Bobby Wagner (SEA) - Wagner does a lot of things pretty well and is quite athletic for his size. Although sometimes slow in diagnosing plays, he's good in coverage and has above average blitzing ability. Wagner has been lining up exclusively in the middle during rookie camp and Head Coach Pete Carroll has stated that he has "one heck of a chance" to start at MLB. The primary issue is that Wagner hasn't been playing in subpackages as the Seahawks have been using a lot of dime looks with K.J. Wright as the sole linebacker. I expect this to continue into the regular season and have therefore cooled on Wagner a bit since earlier in the off-season. 6. LDE Andre Branch (JAX) – Jacksonville is an ideal fantasy landing spot for Branch. Similar to Jabaal Sheard a year ago, he will receive a very healthy amount of defensive snaps early in his rookie season. He's an underrated run defender with good straight linet technique/speed and could surprise a lot of owners with his fantasy production in 2012. Of all the 2012 rookie fantasy DLs, Branch is probably the safest choice for consistent production. 7. OLB Mychal Kendricks (PHI) – Although short in stature, Kendricks is one of the more physical run defending linebackers in this draft class. Philadelphia desperately needed help at the linebacker position and consequently he has already been named the starter on the strong side. He's been playing in subpackages during the preseason, but that may only be because Jamar Chaney has been out with a neck injury. We will have a better idea of how much the Eagles plan to use him in the coming weeks, but he's likely only going to LB4-/LB5+ upside option in most leagues this year. He's a worthwhile sleeper pick in dynasty leagues, however. 8. OLB Zach Brown (TEN) – Brown was once a 1st round prospect. However questions surrounding his work ethic and attitude combined with a mediocre 2011 season caused him to sleep into the middle of the 2nd round. With this said, he's one of the most boom/bust fantasy linebackers in this draft class. With an aging Will Witherspoon on his last leg, the door is open for Brown to come in and be a physical presence on the weak side for the Titans. If you are feeling risky, Brown has LB2+ potential. 9. OLB Nick Perry (GB) - Although most draft analysts suggested Perry was best fit for a 4-3 scheme, he has the size and athleticism to play outside linebacker. The Packers had a big hole at LOLB and Perry figures to slide into the starting role there immediately. His quick first step and playing opposite Clay Matthews make him a decent bet for LB3 potential in big play leagues this season. 10. FS Harrison Smith (MIN) – The combination of a weak safety class and the Vikings significant need for help at the position led them to trade up in the 1st round to get Smith. Although he fits more into the mold of a cover safety than an in-the-box run stuffer like Barron, he's more than willing and capable of coming up in run defense if needed. He will likely be used as a cover high safety in a lot of situations which will limit his tackle opportunity. However, the big play upside is enough to use a late round pick on him as a potential DB3.